Asian style marinades work very well with beef steaks. In this recipe I will use an Asian inspired marinade on flank steaks and then use the reverse sear process to to cook them. If you have not heard of the reverse sear its basically slow cooking the meat to a point where you then finish it off over hot coals for a nice sear on the outside. In this case I will add a step in front and cold smoke the flank steaks for 1 1/2 hours for added flavor. Let's start with the marinade. In a medium mixing bowl combine the following ingredients and stir thoroughly. Once the marinade is made set aside 1/2 cup of the marinade to mop on the steaks during the grilling process. Trim two large flank steaks removing all the fat. Place each steak in its own 1/2 gallon Ziploc bag. Pour 1/2 the remaining marinade into one bag and the remainder into the other. Squeeze out the air and zip the bags closed. Refrigerate over night. In this cook I marinated for 14 to 15 hours. 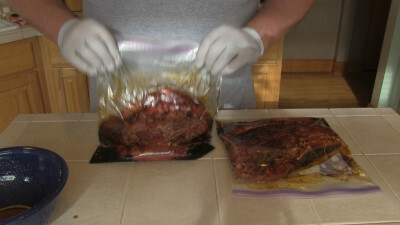 Once the meat has marinated, remove it from the bags and dispose of the marinade. Cut your flank steak into smaller chunks if you wish as I did or leave them whole. 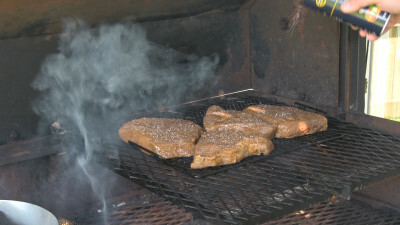 If you have a cold smoke generator, get it smoldering in your cooker and place the steak on the cooking grates. Close the lid and cold smoke for 1 1/2 hours. If you do not have a cold smoke generator you can skip this step. 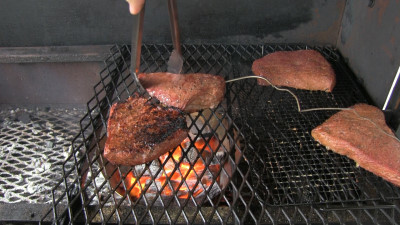 Once the flank steak has cold smoked fire up your cooker and bring it to 225 - 250 degrees. This is the slow cooking part of the process and it's done indirectly. Cook the steaks until they reach an internal temp of 108 degrees. In this cook I'm using a tool called the Vortex by Thunderdome BBQ. 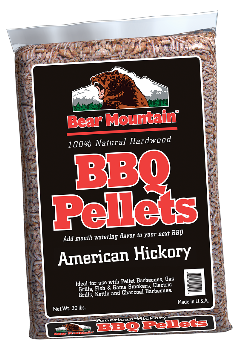 This is a great tool as it keeps the coals nested inside it's core and shields your foods from direct heat. This was designed with the Weber users in mind but it works great in other cookers as well. 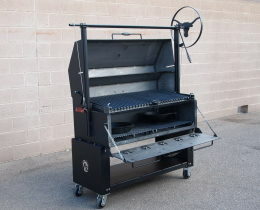 The Vortex is very affordable and can be purchased from MadHunkyMeats.com. Once the steaks reach 108 degrees I then slide the Vortex under the cooking grate directly under the steaks. 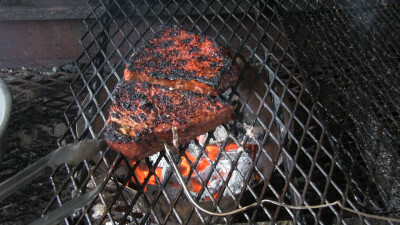 The Vortex focuses heat directly up providing for a nice hot sear. This is the reverse sear part of the process. 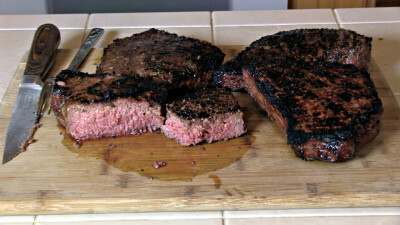 I like my steaks cooked to 138 degrees then pulled off so I take each steak to 122 degrees and then flip the steak. This is a great time to mop on some of the marinade that you set aside. Once the steaks reach your target temp (138 degrees F in my case) remove them from the grill, mop them and let them rest 10 minutes covered in foil. 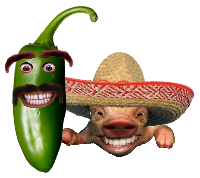 After they have rested serve them up! It's a very simple yet tasty recipe. I hope you enjoyed this recipe and video.